We invite you to be a part of the first SatRday in Southern California! 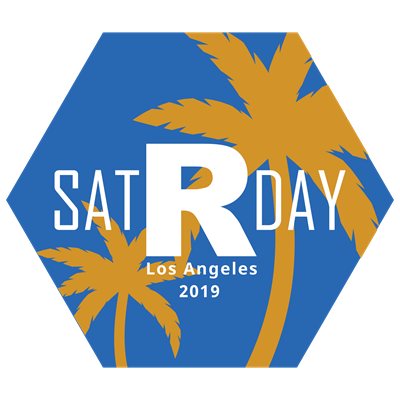 SatRday is an international event that was launched in 2016. It has been sponsored by the RConsortium, the Linux Foundation's open source project supporting the international R community. Events are organized by the local R community and for the local R community! More information about the organization's mission can be found at https://satrdays.org. If you have any questions about the event, please email satrdays.losangeles@gmail.com. We are accepting applications for both speaking and poster sessions. Speakers should indicate whether they are applying for a Session talk (30-45 minutes), Poster, or a Lightning talk (5 minutes). The deadline is midnight Feb 10, 2019. The submission process requires that you create an account on Sessionize prior to submitting your application. - If you are submitting a talk, please let us know if it’s a 30min or 45min talk. If either is fine, let us know! We strongly encourage topics from a variety of disciplines and backgrounds! Aside from having to be to be relevant to R-programming, submissions must adhere to the SatRday code of conduct https://belgrade2018.satrdays.org/code-of-conduct.html.